As rare as the proverbial hen's teeth! 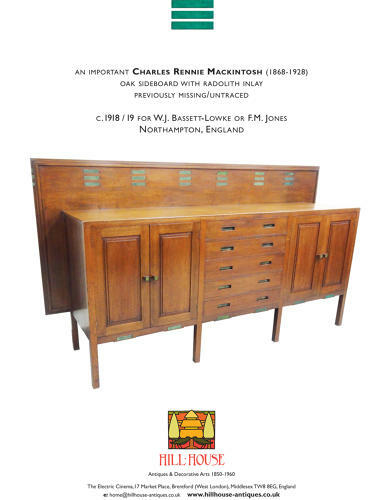 Superb oak and inlaid radolith (erinoid) oak sideboard by the greatest British Arts & Crafts/Glasgow School architect-designer, Charles Rennie Mackintosh. The first was for WJ Bassett-Lowke's home Candida Cottage and the second for Bassett-Lowke's brother in-law, FM Jones (also of Northampton). Both previously missing/untraced, until now with this one! (will open up a pdf brochure about the piece).